The subject of today’s post is an unusual book written by a well-known author. It is a new book and a fabulous read – I literally had to force it out of my hands! But, before going on about this novel, readers, I would like to say a few things about the author. Jim Butcher is an writer whose books have landed on the New York Times bestseller list several times. A fantasy/sci-fi writer, Mr. Butcher’s most famous series is probably his Harry Dresden novels. Harry Dresden is a wizard/detective based in Chicago. He deals with werewolves, vampires, ghosts, faeries (small and big), as well as other wizards. He has even met and talked to angels – good and bad! Two, Mr. Butcher also knows about and enjoys other genres/series, which he also references in his novels. Harry Dresden mentions Marvel characters, the Looney Tunes, The Princess Bride, and even Disney movies throughout his adventures. Harry is by far the wittiest character I have yet seen Jim Butcher write. Though I do not necessarily like everything in the Harry Dresden stories, Harry himself is definitely one of my favorite characters. I am always rooting for him to win. Another book series by Jim Butcher which I have (sort of) read is the Codex Alera series. Okay, technically, I only read the one book. But that was an excellent story, too! Mr. Butcher is said to have received the idea for the Codex Alera series from a fan or casual reader of his work. This man bet the author could not make a series out of two bad story ideas. So Mr. Butcher challenged him to name two bad story ideas, and he would try to make a good story out of them. The fan came back with The Lost Roman Legion and Pokémon. Mr. Butcher succeeded admirably in combining the two, I think. And having never seen Pokémon (except in television advertisements and toys), that connection was not immediately obvious to this reader. The Roman connection, however, was extremely hard to miss! Now, Mr. Butcher has done it again. His newest book, The Aeronaut’s Windlass, came out not too long ago. It is the first book in his new series, The Cinder Spires. Visiting the library sometime back, I saw the book on a shelf of newly acquired novels and literally snatched it up. No way was I going to let this story pass me by! Grabbing a chair, I started reading….and reading…and reading! 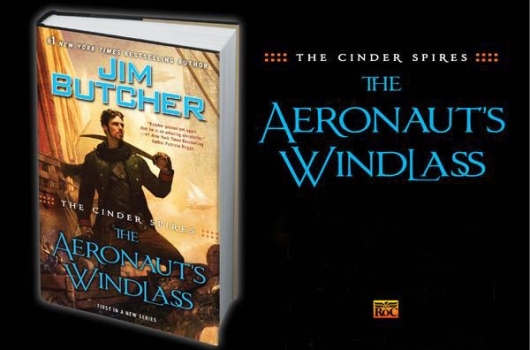 The Aeronaut’s Windlass is set in the far future of Earth. Apparently, by this point Earth has been transformed into an alien jungle. Thick mists separate the land from the sky, and while light still gets through, it does not do so in the way in which we are accustomed. And in this future, normal creatures have either vanished entirely or morphed into monsters that prey on humans. As a result, humanity survives in tall, manmade skyscrapers called Spires. The Spire at the heart of this story is Spire Albion. Several characters in the novel end up working together later on, forming the core group whose exploits will doubtless be the center of this new series. My favorite character in The Aeronaut’s Windlass, however, is Captain Francis Madison “Mad” Grimm, of the Albion privateer ship Predator. Okay, now I have to back up a bit. Obviously, since humans live in the Spires, there are no seas for them to sail. Instead, the humans in The Cinder Spires sail through the air or, when need be, through the thick mists that shroud the Earth. The ships have a combination of steam powered and crystal powered engines. It is for this reason, seemingly, that Mr. Butcher and others call the Cinder Spires series a “steampunk” saga. Almost everything in the Spires is run by steam engines, apparently. These engines, aboard airships, receive their power from crystals specially grown in the houses of the Spire’s nobility. Oh, and nothing in the Spires is made of exposed steel or iron. Once that metal is open to the elements, it rusts and falls apart within days. Everything is made of copper, brass, or some other metal. Anything that is made of steel or iron is covered by either of these metals so that it will not corrode. The airships’ engines, run by the crystals I mentioned before, keep the vessels aloft by riding on the etheric currents that flow through the atmosphere. These currents flow around everyone – even in the Spires! There are, though, some people who have etheric currents flowing right through them. These people are wizards known as etherealists (all of whom are nuts as a result of constantly having etheric currents flowing through them; as usual, some of these wizards are good crazy, and others are bad crazy). You can tell Butcher is a thorough-going Star Wars fan. Etherealists use etheric currents like the Jedi or the Sith use the Force! Both the currents and the Force flow around and through people all the time, after all! Captain Grimm is a great character. Cashiered from Spire Albion’s defense fleet for cowardice, Grimm is no coward. But the latest prize he tries to snare in his privateering business is only bait for a trap to catch him and Predator. Narrowly escaping that disaster, Grimm loses several men in the skirmish. But the worst damage is to Predator’s core crystal. It has cracked, beyond repair. Core crystals for ships are so expensive they are practically priceless. The only ships that can afford them are Fleet ships. So the chances of Grimm gaining such a crystal are…. nil, nada, and zip. But Grimm is determined not to give up his ship. Ever since he got out into the open air, he has loved nothing else. The idea of living a Spire-bound life horrifies him, and by this point, it would probably qualify as a death sentence. He will not give up his ship. Somehow, some way, he has to get her skyworthy again. Grimm is my favorite character in the whole book, as I said. Mr. Butcher described the novel as a combination of The League of Extraordinary Gentlemen “meets Sherlock Homes meets Horatio Hornblower,” prior to the novel’s release. I think this is one of the reasons Captain Grimm appealed to me so much. I was introduced to Hornblower through Masterpiece Theater as a child, and I have had a special love for Mr. Hornblower, the sea, and wooden sailing ships ever since. Grimm’s skills as a captain are spectacular. If I do not miss my guess, Spire Albion is based on 19th century England, and Grimm has at least some resemblance to her most famous privateer, Francis Drake. He also has a dash of Captain James T. Kirk in him. Star Wars fan that he is, Mr. Butcher doubtless realized (as others have), that Star Trek was more accurate in terms of how it presented space travel as the future form of seafaring. Captain Kirk was drawn accordingly, and so is Captain Grimm, whose ship also plies the skies – though not the galaxy! Most of Grimm’s character, however, is his own. Despite his resemblance to other heroes, fictional and historical, he is a great protagonist for this new series. As a friend of mine said, “He is smart in how he handles his ship, and wise in how he handles his people.” Grimm reads and takes the measure of his enemies with the care of a scientist, never ceasing to think or wasting his assets if he can help it. He deeply cares about his crew, and remains concerned for the welfare of the young guards whom the Spirearch charges him to support and protect in the novel. This is a truly tremendous, fascinating book, readers. And the series that follows it can only get better from here! So grab a copy of The Aeronaut’s Windlass and settle down with it as quickly as you can, if I may be so bold! It is well worth reading! This entry was posted in Book Reviews and tagged authors, Book Reviews, Captain Francis Madison Grimm, Captain Grimm, Chicago, Codex Alera, Fantasy/Sci-Fi, Grimm, Harry Dresden, Horatio Hornblower, Jim Butcher, Marvel, Marvel Comics, New York Times, Pokemon, Predator, sci-fi, seas, Sherlock Holmes, Spires, Star Trek, Star Wars, The Aeronaut’s Windlass, The Cinder Spires, The League of Extraordinary Gentlemen, The Lost Roman Legion, The Princess Bride on May 20, 2016 by The Mithril Guardian. Due in part to sullysgirl’s comment on one of my posts many moons ago, I picked up and began reading several Father Brown stories. 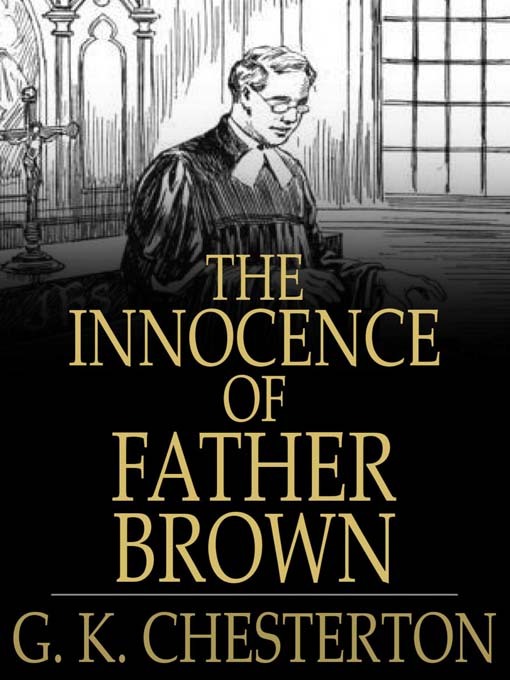 Written by G. K. Chesterton, the stories focus on the crime-solving adventures of the intrepid Father Brown. Unlike “high-functioning sociopath” Mr. Holmes, Father Brown is approachable and friendly – but he has steel in his bones and a keen mind to match, or perhaps even outmatch, Mr. Holmes. The volume of Father Brown material that I first read was, naturally, The Innocence of Father Brown. I enjoyed several stories more than the others and, though it has been some time since I last clapped eyes on a Father Brown tale, I think I can remember my favorites well enough to sketch an outline of them for you, readers. The first Father Brown mystery I fell in love with is the first story G. K. Chesterton ever wrote for the daring little priest: The Blue Cross. Throughout the tale a French investigator tracks a famous French art thief named Flambeau through London since he received a tip that he will be there to steal a valuable artifact. A series of strange accidents – salt in the sugar containers at a restaurant, an upset cart of fruit, a broken window at a post office – lead him to two clerics walking through a park. Other stories I enjoyed in the volume were The Queer Feet and The Flying Stars. In The Queer Feet, Father Brown must stop at the club of the Twelve Fisherman, a gentlemen’s association with some bizarre (to me, at least) dining habits. For instance, the group eats with gold utensils that have a pearl set in each piece of cutlery’s handle. These are stolen and subsequently rescued by Father Brown. In The Flying Stars, at Christmas Father Brown visits a well-to-do family. The patriarch happens to be hosting a relative from Canada at the same time he (the patriarch) is holding in his possession three very valuable diamonds. The diamonds are called the Flying Stars because they have been stolen so often. The merrymaking for Christmas Day begins when the visitor from Canada suggests a pantomime – then disappears, as do the Flying Stars! More stories in the volume which I enjoyed were The Invisible Man and The Hammer of God. I cannot recall much about why I enjoyed these, since The Invisible Man was about a postman who committed some crime (it may have been murder, I cannot recall now) while The Hammer of God was about a Minister who, while praying in the loft of his church, saw his brother of ill repute preparing to meet a married lady. The final two stories in The Innocence of Father Brown which I found enjoyable are The Eye of Apollo and The Three Tools of Death. In The Eye of Apollo a man claiming to be a priest of the sun god Apollo takes up residence in an office building in London. Flambeau, now an honest tradesman, happens to be working in the building as a private investigator. Ever a gallant fellow, he has made the acquaintance of two young women who work in the building as well. The two are sisters. But what sisters! The older woman is beautiful, forceful, and a follower/paramour of Apollo’s new priest, while the younger sister wears glasses and hunches over her work at her desk, bullied by her older sister. Flambeau likes the older sister very much, and is stunned when she falls to her death in an elevator shaft at the same moment Apollo’s priest has gone out on the balcony to publicly worship the sun. In The Three Tools of Death a famous philanthropist and eternal optimist is found dead. His daughter’s fiancé is accused of murdering him, as he was found apparently trying to kill him with a knife, a pistol, and a noose. Who can read such a riddle? Father Brown sits down with the young fiancé, surrounded by the police, and finds the truth. Some stories, readers, like good wine, get better with age. G. K. Chesterton’s Father Brown mysteries are such stories. I greatly enjoyed them, and I would hereby like to take the time to publicly and heartily thank sullysgirl for setting me on the road to reading them! This entry was posted in Book Reviews and tagged Book Reviews, crime, Father Brown, G. K. Chesterton, mystery, Sherlock Holmes, The Innocence of Father Brown on June 5, 2015 by The Mithril Guardian.